Maybe you’ve heard the story of about a gift of black tea and bergamot oranges being sent from China, only to have the tea accidentally absorb the orange’s flavor during shipping. Or the one about how a friend of the Earl Charles Gray blended bergamot oil into the Earl’s tea because of the mineral flavor of the water? Or maybe how the recipe for Earl Gray Tea was actually given to the Earl as a reward for his accomplishments in China? However the recipe came about, today Earl Gray Tea is a well-loved favorite with many benefits. The bergamot in Earl Gray Tea relaxes and relieves stress, fights anxiety and depression, and boosts mood. And it has enough caffeine for a boost of energy, clarity, and focus. One of the most popular effects of Earl Grey Tea is weight loss, and it is considered to be a natural cold remedy, both thanks to the bergamot extract. Tea helps you stay hydrated due to its high potassium content. Earl Grey Tea contains high quantities of antioxidants, which helps fight off free radicals that cause diseases such as cancer. Antioxidants also help your skin to stay healthy by fighting the free radicals that damage skin. A study found that people who drank three cups of black tea daily dramatically lowered their triglyceride levels and increased their ‘good cholesterol’ HDL after three months, lowering their risk for heart disease. The participants also had increased levels of antioxidants. And research on patients with high levels of blood fats found that ‘bad’ cholesterol (LDL) was reduced by 39% after a month of taking Earl Grey extract. It also reduced blood sugars by 22% and raised ‘good’ cholesterol by 41%. The reduction in blood sugar also shows that Earl Grey Tea may be highly beneficial for those suffering with diabetes. But the best thing about Earl Gray Tea is that it is delicious, which is why BRANSON’S CHOCOLATES created our EARL GRAY TEA SQUARES. We steep Earl Gray Tea into rich cream, and then stir it into a dark chocolate ganache. We cover the ganache in milk chocolate, and top it with a stripe of more dark chocolate. We are passionate about local products from local vendors, so we use tea from Full Leaf Tea Company based in White City, and cream from Umpqua Dairy. The Oregon Chocolate Festival at Ashland Hills Hotel & Suites, March 4th-6th, Friday & Saturday. The Oregon Cheese Festival at Rogue Creamery on March 18th-19th, Saturday & Sunday. Branson’s Chocolates is beginning 2017 with introducing Matcha Green Tea Squares. 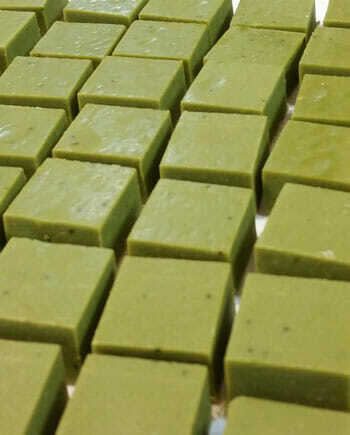 Matcha powder is mixed into a white chocolate ganache, formed into squares, and then topped with a sprinkle of matcha powder. According to many studies, matcha tea makes this a sweet treat loaded with benefits: L-Theanine, an amino acid known to create calmness and improve memory, powerful antioxidants including polyphenols and EGCg which is believed to be a powerful anti-carcinogen and catechins which help lower LDL cholesterol, to name a few. 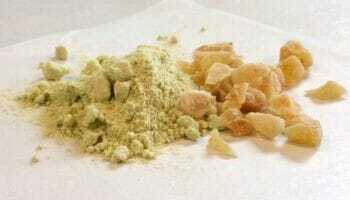 Thanks to http://www.naturallivingideas.com/10-amazing-benefits-of-matcha-green-tea/ . January 20th & 21st, Friday 4-9pm & Saturday 11am-6pm, we will be at ChocolateFest at the Oregon Convention Center in Portland. It is the ‘Northwest’s Premier Chocolate Festival’ with over 70 vendors of chocolates, treats, and libations. We’ve been going to ChocolateFest for seven years, and it’s an amazing experience for chocolate lovers. 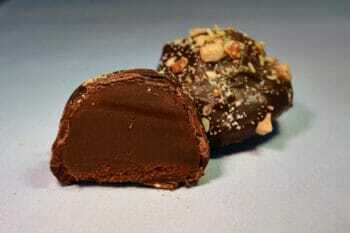 In fact, our Rich Chocolate Truffle won the People’s Choice Award for Best Truffle at ChocolateFest. For more details go to chocolatefest.org . If you have ever wondered what exactly a Truffle is, or what different flavors of chocolate bars we sell this will provide all of the answers to your questions. Over the next couple of months I will be writing separate blog posts on the different types of confections we offer including Truffles, Cremes, Chocolate Bars, etc. Today we will be talking about one of our favorites; Truffles! So what exactly is a truffle? 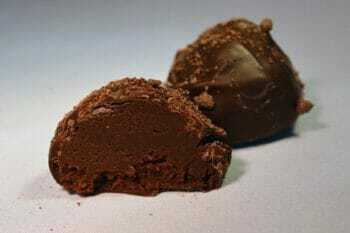 A truffle has a ganache, (a combination of a chocolate butter cream and flavoring) based center. 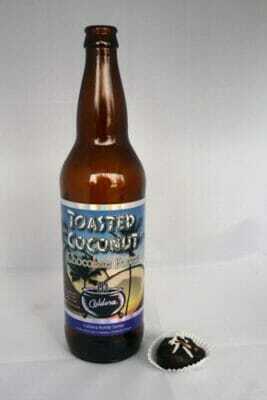 All of our truffles are gluten free except our specialty beer truffles. 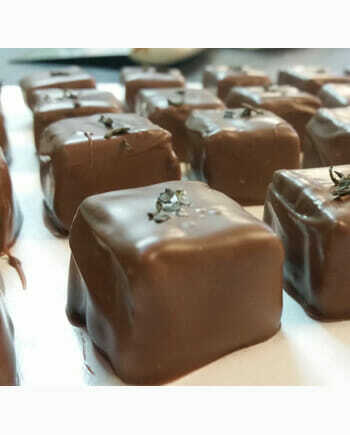 Our truffles are made by creating the center and dipping them twice in chocolate as opposed to being dipped only once or being processed in a mold. All of our truffles are handmade with no chemical preservatives used. Click here to read more about dietary concerns pertaining to each individual truffle. If you enjoy our truffles and are looking to expand your repertoire, we recommend the Wasabi and Jasmine which are also ganache based confections. 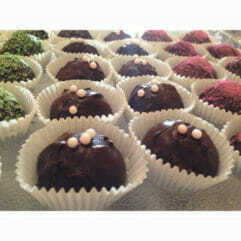 Each individual truffle can be purchased for $2.50 and we offer a discounted price on our six piece box. Many of our truffles along with many of our other products can be purchased here on our website or in our retail location at 1662 Siskiyou Blvd in Ashland, OR. We have eleven regular flavors of truffles and six specialty flavors. 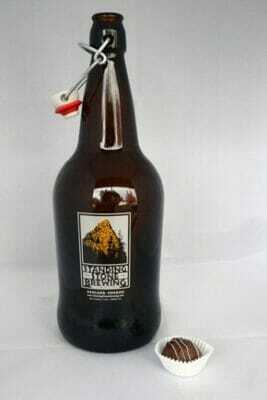 Specialty flavors include our “Beer Truffles” made from locally produced beer. Our Amaretto Truffle is made with Deseranno mixed into the ganache because of the more natural almond flavor as opposed to almond extract.The truffle is topped with chopped almonds. 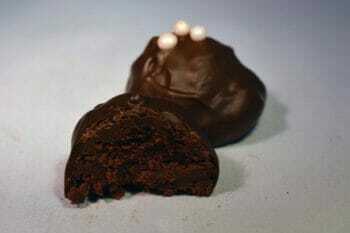 Our Blackberry Truffle is made with Brandy Peaks Blackberry Liqueur (Brookings, OR) mixed in with the ganache. 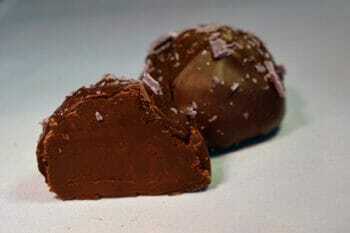 The truffle is topped with a purple colored white chocolate. 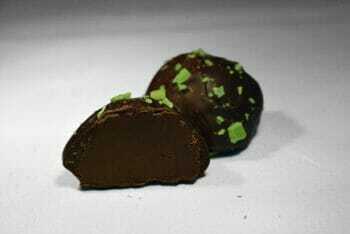 Our Creme de Menthe truffle is made with Creme de Menthe and topped with a green colored white chocolate. 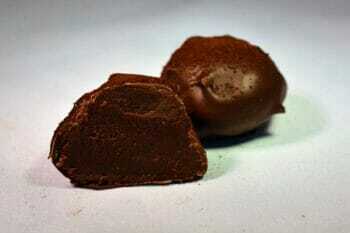 Our Espresso Truffle is made with espresso grounds from Rogue Valley Roasting company. The truffle is topped with more espresso grounds. 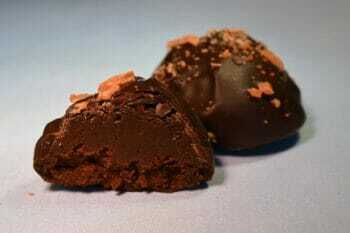 Our Orange Truffle is made with Crescendo Arancello Organic Orange Liqueer (Eugene, OR). The truffle is topped with an orange colored white chocolate. 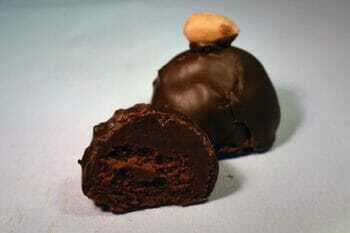 Our Hazelnut Truffle uses Frangelico and is topped with a roasted hazelnut grown in the state of Oregon. Our Pomegranate Truffle is made with Pama, a pomegranate liqueur, and topped with a pink sugar pearl. 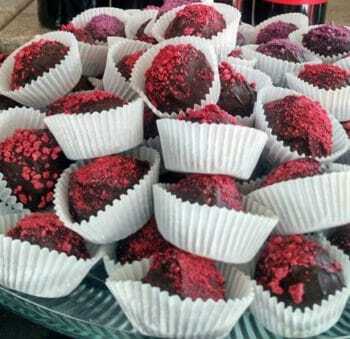 Our Raspberry Chambord Truffle uses Raspberry Chambord, a black raspberry liqueur from France. 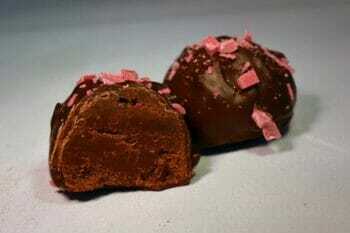 The truffle is topped with pink white chocolate. 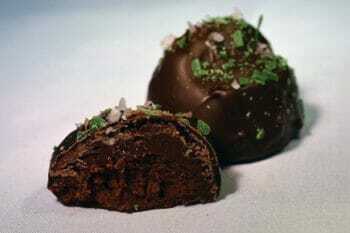 Our Tequila truffle uses Patron Silver topped with a mix of lime flavored green white chocolate and Fleur de Sel sea salt. 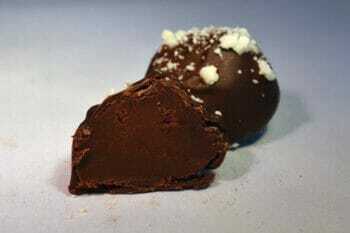 Our Rum Truffle uses 4 Spirits Silver Rum and is topped with white chocolate. 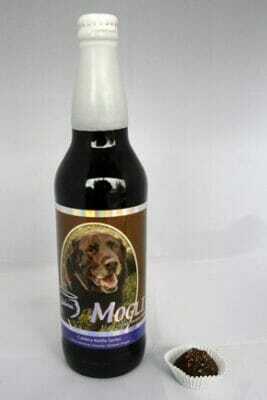 Our Mogli Truffle is produced with Caldera Brewery Mogli and dusted with cocoa powder. 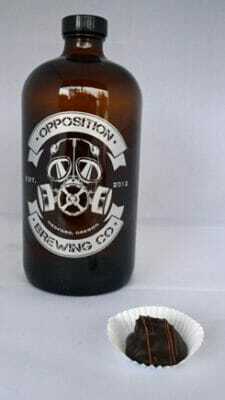 Our Tunguska Truffle is produced with a cream style ale by Opposition Brewery. 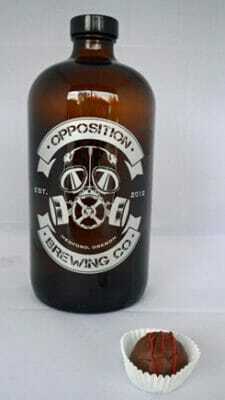 Our Bloody Hippie Truffle is made with a blood orange wheat brew and topped with red chocolate. 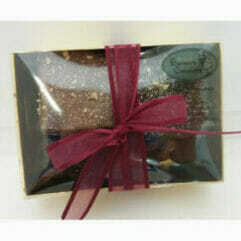 Our Milk & Honey truffle is produced with Standing Stone Milk and Honey and topped with white chocolate. Our Toasted Coconut Truffle is Produced with Standing Stone Brewery’s Toasted Coconut and topped with flakes of toasted coconut. 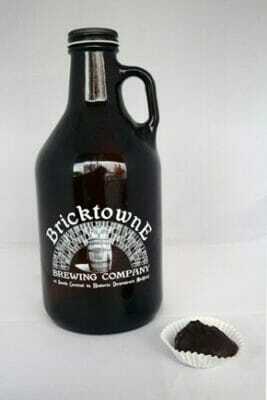 Our Siskiyou Pass Truffle is made with Bricktowne Brewery Siskiyou pass and topped with dark chocolate. If you like your dessert a little spicy, or slightly exotic, or even a bit adventurous, we have the chocolate for you—Wasabi Ginger Chocolate is our Product of the Month for March. We add wasabi powder to a chocolate ganache square and top it with a piece of candied ginger. It’s a gourmet treat for adventurous chocolate lovers which is inspired by a wasabi ginger potato chip. Easter is early this year, on Sunday March 27. So plan ahead and pick up some of our Chocolate Bunnies, in sweet Milk Chocolate or rich Semi-Sweet Chocolate before they’re gone. 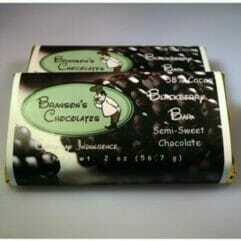 We will also have gift boxes of chocolate, perfect for your Easter basket, and filled with your favorite chocolates. Be sure to catch our March Chocolate Talk video on our YouTube channel https://www.youtube.com/c/BransonsChocolatesAshland . Our videos are always directed and shot by Brian Goodwin, and feature, of course, our newest items—Wasabi Ginger Chocolate. Every month you will find me there, making our latest product, and talking about chocolate. You can also find us on Facebook at https://www.facebook.com/bransonschocolates , where you’ll find out all about our latest events and happenings, and if you follow us on Instagram at https://instagram.com/bransonschocolates/ or @bransonschocolates, you know that’s where we post mouth-watering photos of our delicious chocolate. Happy New Year, and welcome to 2016! At Branson’s Chocolates, we are excited for the changes that a new year always brings. One of those changes is our expansion. We are excited to start using our new addition, which is set to become our packaging room where we’ll be wrapping and packaging our mouth-watering chocolates for both retail and wholesale. Another exciting New Year’s announcement is January’s Product of the Month– Jasmine Tea Squares, part of our gourmet chocolate line. We’ve mixed exotic jasmine tea into a semi-sweet ganache center, which is then dipped in delicious Belgian milk chocolate and topped with a sprinkling of jasmine tea. It’s a delicious combination of bitter tea’s antioxidants and jasmine’s floral delicacy with gourmet Belgian chocolate. Blissful everyday indulgence! Jasmine tea is a sweet, fragrant, floral tea made by scenting tea leaves with just-blossomed jasmine flowers. The flowers are mixed with the tea leaves in temperature-and humidity-controlled rooms. Tea leaves are naturally highly absorbent and therefore make the perfect base to accept the fragrant scent of the jasmine flower simply by coming into close contact with the blossom. The flavor of jasmine tea is coveted, and is often used to flavor tea-infused dishes, especially desserts like chocolate. In aromatherapy, jasmine essential oil is believed have a tranquilizing effect. And a 2005 study conducted by Kyoto University found that the smell of jasmine reduced study participants’ heart rates and produced “calm and vigorous mood states.” Jasmine tea is also full of powerful anti-oxidants which can help protect your body against damage from free radicals. Be sure to catch January’s Chocolate Talk video on our YouTube channel https://www.youtube.com/c/BransonsChocolatesAshland . Brian Goodwin directs and shoots all of our Chocolate Talk videos, which feature our current Product of the Month confection —which is Jasmine Tea Squares this month. Check us out on Facebook athttps://www.facebook.com/bransonschocolates , where you’ll find out all about our latest events and happenings, and follow us on Instagram athttps://instagram.com/bransonschocolates/ (we’re @bransonschocolates by the way) because you know that’s where to find mouth-watering photos of our delicious chocolate. We’re often out and about at many of the local wineries and events, and January is no exception. January 22-24, we’ll be at ChocolateFest in Portland at the Oregon Convention Center. You can find more information about ChocolateFest at http://chocolatefest.org/ . 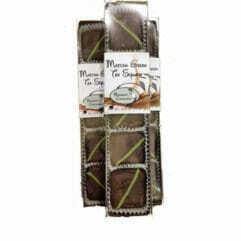 Thanks to http://www.amazing-green-tea.com/jasmine-tea-benefits.html and http://www.teatulia.com/tea-101/what-is-jasmine-tea.htm .